SAE Products® heavy duty grease fitting cleaner unblocks severally clogged fittings allowing grease to flow freely. 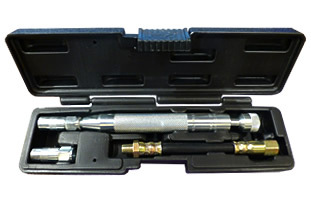 A light viscosity oil is injected into the fitting through a piston in the tool body which breaks up hardened grease. Made in The USA. Features molded case with sliding lock, flexible hose, and heavy duty coupler.